Just as the heart of any home is the kitchen, härth has become the centerpiece of the Hilton McLean Tyson Corner guest experience. 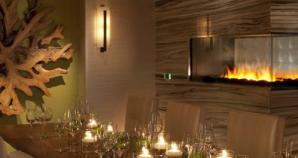 Boasting a wood-burning oven and cozy fireside ambiance, härth welcomes diners 365 days a year. härth is so committed to farm-to-table practices and the use of locally sourced ingredients that we have our own rooftop beehive to produce 200 pounds of honey a year. Additionally, our hotel’s organic garden provides a variety of herbs, fruits and vegetables – all incorporated into a menu that offers traditional American comfort foods with a distinctive and creative flair. härth takes a modern, fresh approach to dining, serving seasonal local produce, Virginia-raised meats and a diverse cocktail, wine and beer list comprised of many iconic labels from around the region.